For as long as humankind has waged war, it has pursued better means and methods of warfare to defeat the enemy. From the subterfuge of the original Trojan Horse, to Galileo encouraging frontline soldiers to acquire basic knowledge of mathematic principles so they could accurately fire cannonballs, to the United Kingdom keeping its development of radar technology in World War II secret by spreading misinformation that eating carrots allowed its pilots to see in the night—all militaries seek to achieve their belligerent goals by amassing advantageous resources and employing them in advantageous ways. The right of parties to an armed conflict to choose methods or means of warfare is not unlimited. The only legitimate aim of warfare is to weaken the military capacity of the enemy, and an armed force may not employ means and methods of warfare such as to violate international humanitarian law (IHL), the laws of armed conflict. In the previous installment of this series, we examined the rules on the conduct of hostilities which dictate which targets may be attacked: the principle of distinction, the principle of proportionality, and the requirement to take precautionary measures. In this article, we’ll discuss the use of weapons (the means of warfare), and the way in which resources are employed (the methods of warfare). The means of warfare refers to the weapons, weapons systems, and platforms employed for the purposes of attack. It’s lawful in the conduct of hostilities to attack an enemy with the intent of killing or disarming them, but that right is not unlimited. Many civilizations throughout history placed restrictions on the weapons permitted in armed conflict. The ancient Greeks and Romans forbade poison or poison weapons, and the ancient Hindu “Laws of Manu” prohibited the use of poisoned or burning arrows. Means of warfare may breach the principle of distinction, the cardinal requirement to distinguish between combatants and civilians and between military objectives and civilian objects, or the prohibition against causing superfluous injury and unnecessary suffering, being a harm greater than that unavoidable to achieve legitimate military purposes. Some weapons are inherently unlawful and prohibited in all circumstances, while some are prohibited only if used in a certain manner. Crucially, in the study, development, acquisition or adoption of a new weapon, means or method of warfare, nations are under an obligation to determine whether its employment would be prohibited. Let’s take a thematic tour of the law on means of warfare. If we sat down and tried to design a weapon that would most efficiently and comprehensively violate the laws of armed conflict, we might well come up with the landmine. Mines are inherently incapable of distinguishing between combatants and civilians, and as a matter of course cause superfluous injury and unnecessary suffering. Mines are cheap to manufacture or purchase, easy to use, and once laid last forever. Their removal is difficult, expensive, and often deadly. It’s estimated that more than 87 percent of landmine casualties are civilians (nearly half of which are children), with most victims being children playing in fields, refugees and displaced persons returning to their homes after a conflict, or civilians engaging in livelihood activities such as farming or collecting water. The explosive effect of mines cause gruesome injury to its victims—those who survive often lose limbs and suffer permanent facial and bodily scarring. Nations who made a quick buck selling from their existing stockpiles ultimately spent far greater sums contributing to mine clearance programs. And, ultimately, landmines are militarily ineffective: A 1996 study by the International Committee of the Red Cross found that mines are easily bypassed, can be just as dangerous to the force laying the mine than to the enemy, and have never yielded a decisive advantage in any armed conflict in history. Broadly speaking, there are two types of landmines: anti-personnel mines, triggered by the application of roughly 5-50 kilograms of pressure; and anti-vehicle (or anti-tank) mines, detonated by approximately 100-300 kilograms of pressure. There are two types of anti-personnel mines: blast mines (subsurface mines which explode when trodden on), and fragmentation mines (activated by tripwires, including “jumping mines,” which cruelly jump up to stomach height before exploding). The distinguishing feature of landmines is that they are “victim-activated,” rather than relying on a combatant to effect the detonation, and are therefore incapable of distinguishing between combatants and civilians. It’s estimated that more than 87 percent of landmine casualties are civilians (nearly half of which are children), with most victims being children playing in fields, refugees and displaced persons returning to their homes after a conflict, or civilians engaging in livelihood activities such as farming or collecting water. After decades of calls for an end to the use of landmines, the historic 1997 Ottawa Convention marked the first-ever treaty banning a widely-used weapon. The Convention prohibits the use, development, production, stockpiling, and transfer of anti-personnel mines, and requires state parties to destroy existing stockpiles. Parties are to identify all areas under its jurisdiction or control in which anti-personnel mines are emplaced, to protect those areas from civilians, and to destroy all the mines, and to provide international assistance to mine-clearance programs and to the rehabilitation of victims. The Convention currently has 164 state parties, including many nations affected by mines such as Cambodia, Afghanistan, and Angola, but not including countries such as the United States, Russia, China, or the Koreas. The Convention has been a remarkable success: since its introduction, state parties have destroyed over 51 million mines, 161 parties no longer hold stockpiled anti-personnel mines, and the legal trade of anti-personnel mines has virtually disappeared. The success of the Ottawa Convention has spawned two major treaties attacking other forms of unexploded ordnance in broadly the same manner: the 2003 Protocol on Explosive Remnants of War, and the 2008 Cluster Munitions Treaty. 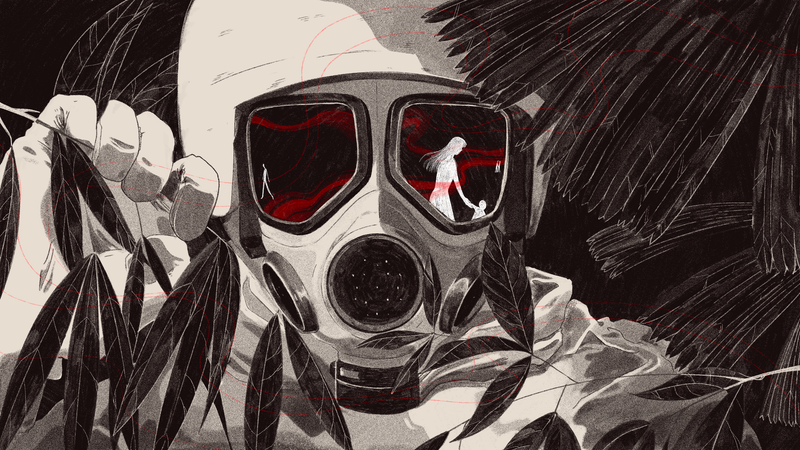 Biological and chemical weapons are prohibited in armed conflict because they attack indiscriminately, cause unnecessary suffering, and almost always cause disproportionate civilian harm (through both primary injury and the lasting effects on air quality). The first-ever chemical weapons attack was the use of chlorine gas by the German army on French and Algerian forces in Ypres, Belgium, in 1915. The British army responded in kind, leading to a vicious cycle of retaliatory attacks, and by the end of World War I an estimated 100,000 combatants and civilians had been killed by chemical weapons. Chemical warfare agents can be classified in different categories depending on their effect, from blistering agents such as mustard gas (intended to disable a soldier without killing them by forming micro-droplets which cause chemical reactions in the body akin to blisters) to nerve agents like sarin gas (which stop the activity of an enzyme associated with the body’s muscles, causing the lungs to cramp and resulting in a high mortality rate), to blood agents like cyanide (which prevent cell respiration and also result in a high mortality rate). Many chemicals can, of course, have legitimate and beneficial uses outside of warfare—such as chlorine, a toxic industrial chemical that is used to purify water, thereby reducing the risk of water-borne disease. It is therefore not desirable to place a comprehensive ban on the possession or trade of all chemicals which may be used to produce unlawful weapons; rather, relevant treaties prohibit such weapons but impose careful regimes of regulation and inspection on substances which may constitute their component materials. The 1899 Hague Declaration had already prohibited the use of “asphyxiating or deleterious gases.” In response to the horrors of World War I, the 1925 Geneva Protocol for the Prohibition of the Use of Asphyxiating, Poisonous or Other Gases, and of Bacteriological Methods of Warfare extended and strengthened the prohibition. The 1972 Biological Weapons Convention was the first disarmament treaty to ban the development, production, and stockpiling of an entire category of weapons of mass destruction. That treaty applies to “microbial or other biological agents” that have no justification for prophylactic, protective or other peaceful purposes. The Convention currently has 182 state parties (with Israel the only major resistor) who are obliged to destroy all such weapons under its control, and provide annual reports on specific activities including data on research centers and laboratories, information on vaccine production facilities, and information on current and past national biological research and development programs. The 1993 Chemical Weapons Convention prohibits the belligerent use of toxic chemicals, defined as “any chemical which through its chemical action on life processes can cause death, temporary incapacitation or permanent harm to humans or animals,” plus everything that enters into their composition. The Convention permits the use of toxic chemicals for purposes such as industry, agriculture, research, medicine, and pharmacy. The types and quantity of toxic chemicals and their precursors held by a state party must be consistent with these purposes. Parties to the CWC (Egypt, Israel, North Korea, and South Sudan are the only holdouts) may not use chemical weapons, nor develop, produce, stockpile, retain or transfer them. They must declare the quantity and location of their existing stockpiles, and destroy their chemical weapons and production facilities. All parties must agree to inspection and verification procedures carried out by the Organization for the Prohibition of Chemical Weapons (the recipient of the 2013 Nobel Peace Prize). The OPCW reports that more than 96 percent of the world’s declared chemical weapons stockpiles have been destroyed. The use of asphyxiating, poisonous or other gases, and all analogous liquids, materials or devices in an armed conflict is a war crime. Ever since the detonation of atomic bombs over Hiroshima and Nagasaki—the latter only substituted as the United States’ target on the morning of the attack because smoke clouds over the primary target of Kokura made visual bombing impossible—the world has reckoned with the possibility that another escalation of military hostilities could end with all life on our planet being summarily destroyed. A drawn-out struggle has been waged between the nuclear powers of the world who wish to reserve their right to use their nuclear arsenal in case of necessity and otherwise hold them as defensive deterrents, and the peoples of the world who wish to ensure that mushroom clouds of death are never seen again. More than 70 years on from the attacks on Japan and it’s so far, so good, though the threat of nuclear war always looms. Nine nations of the world have nuclear capability: United States, Russia, United Kingdom, France, China, India, Pakistan, Israel (though it has deliberately never confirmed its membership of the nuclear club), and North Korea. The nations of Belarus, Kazakhstan, and Ukraine each inherited nuclear weapons upon the collapse of the Soviet Union but later voluntarily disarmed; South Africa’s white supremacist regime dismantled its nuclear arsenal ahead of the end of apartheid because it did not want to hand its weapons over to a non-segregated government. The awesome destructive power of nuclear weapons raises three seemingly insurmountable issues under the laws of war: how they could ever be employed without violating the principle of distinction (seeing as they are inherently incapable of being directed solely at combatants); how they could comply with the rule against causing unnecessary suffering (given the devastating after-effects of radiation in addition to the initial blast and shock); and how they could ever be employed without causing severe damage to the natural environment. As yet, there is no comprehensive prohibition on the use of nuclear weapons in all circumstances, as the nuclear powers of the world (and their allies) insist on their right to employ them as a means of last resort. The political and legal battles have raged since the discovery of nuclear energy; indeed, the first-ever United Nations General Assembly Resolution—Resolution 1!—established a commission “to deal with the problems raised by the discovery of atomic energy.” The issue of nuclear weapons is inextricably linked with with fight for peace—indeed, the peace symbol ☮ was created by artist Gerard Holtom by combining the sempahore signals for N and D, for “Nuclear Disarmament”. The famous 1968 Treaty on the Non-Proliferation of Nuclear Weapons was spearheaded by the United States, the United Kingdom, and the Soviet Union as a means to both legitimize their possession of nuclear weapons and to prevent other nations from obtaining them. The treaty permits existing nuclear powers to retain their weapons but prohibits non-nuclear powers from developing or acquiring them, with the trade-off being that nuclear powers are to share the benefits of peaceful nuclear technology. All parties are to pursue negotiations in good faith for the cessation of the nuclear arms race and to nuclear disarmament. As yet, there is no comprehensive prohibition on the use of nuclear weapons in all circumstances, as the nuclear powers of the world (and their allies) insist on their right to employ them as a means of last resort. Various other treaties establish nuclear weapon-free zones in Antarctica, Latin America and the Caribbean, the South Pacific, South-East Asia, Africa, and in outer space, the atmosphere, and underwater—with each having achieved varying levels of ratification by nuclear powers. The Treaty on the Prohibition of Nuclear Weapons—the first globally applicable multilateral agreement to aim to comprehensively prohibit nuclear weapons—was concluded in 2017 after decades of build-up. It prohibits the use, threat of use, manufacture, development, testing, production, acquisition, possession, and stockpile of nuclear weapons, and requires total nuclear disarmament, victim assistance and rehabilitation, and international assistance and co-operation in implementation of the treaty. At this early stage there are currently 19 states parties to the treaty, plus 50 more signatories who are progressing through their domestic ratification procedures. None of the world’s nuclear powers will join the treaty in a hurry, anxious as they are to reserve their right to use their weapons, but that doesn’t nullify its worth—a comprehensive ban will not be achieved overnight, and the treaty is another tool to strengthen the accord of the significant majority of states that nuclear weapons are absolutely prohibited without exceptions, providing another layer of legitimacy to anti-nuclear efforts and keeping pressure on nuclear states in the long fight to total disarmament. The Hague Regulations (concluded in 1899), the Geneva Conventions (1949) and the Additional Protocols to the Conventions (1977) do not specifically address cyber warfare, unforeseeable as it was in those days. While this isn’t necessarily a fatal problem—the laws of war don’t specifically address guided weapons, either, for example—the specific characteristics of cyber operations mean that there is large scope for debate as to the correct application of existing laws. The evolution of the debate amongst states in the international arena as to the scope and content of the laws on cyber warfare is one of the most important areas in contemporary international law, as technologies and state practice continue to rapidly evolve. Here’s a quick sampling of the fundamental issues. When is a cyber operation governed by the laws of war, rather than simply by “regular” laws? “Attacks” in war must obey the principle of distinction and only be targeted at military objectives, but this does not cover all actions by militaries in time of armed conflict—propaganda campaigns, for example, may be aimed at increasing the chances of military victory, but are not considered “attacks” and can therefore be directed at civilians. An “attack” is defined under the laws of war as an “[act] of violence against the adversary, whether in offense or in defense,” but are non-kinetic cyber operations considered to be violent? Is it sufficient for a cyber operation simply to be of a belligerent nature? What if it causes adverse but non-violent effects, such as disruptions to a nation’s power grid or banking system? Could a cyber attack itself enliven an armed conflict? Under the United Nations Charter, the “use of force” by one nation against another is prohibited, and the existence of an “armed attack” triggers a nation’s right to self-defense. Can cyber operations alone be considered “forceful” or “armed”? Why should a nation not be entitled to respond in self-defense to, say, an attack causing release of dangerous material from a nuclear power plant, if it was carried out by electronic rather than traditional military means? Another difficult issue is with attribution of a cyber attack. Nations may well engage rogue non-military hackers to carry out cyber operations on its behalf (often through several opaque layers of outsourcing), or encourage such operations amongst its population with the tacit promise of legal protection. Depending on the instructions and support given by the military, such actions of non-military actors may be attributed to the state, just as in traditional warfare. Famously, the International Court of Justice found that the United States had encouraged the violation of humanitarian law by Nicaraguan contras in the 1980s by producing a manual titled Operaciones sicológicas en guerra de guerrillas, but this encouragement was not sufficient to make the contras’ violations attributable to the United States. Persons carrying out cyber operations which are governed by the laws of war are directly participating in hostilities. Military personnel enjoy combatant privilege and cannot be prosecuted for lawful acts of war, but outside actors who carry out wartime operations would not be entitled to prisoner of war status if captured and would likely face domestic prosecution by the enemy state (perhaps under anti-terrorism or espionage laws). In addition, a coordinated collective of cyber operatives is theoretically capable of constituting an organized armed group which may itself be a party to a non-international armed conflict, even in the absence of an accompanying traditional military wing. In the conduct of hostilities, cyber attacks must respect the principles of distinction, proportionality, and precautions. Due to the interconnectedness of electronic systems, it is not always possible to limit a computer network attack to purely military objectives, and some types of attack (such as some worm viruses) may be inherently indiscriminate. Although much of cyberspace can properly be considered legitimate military objectives which may be lawfully attacked—command, control, and communication (CCC) networks, military air traffic control systems, classified data, and so on—any effect on civilian objects must be proportionate to the military advantage gained. Famously, the International Court of Justice found that the United States had encouraged the violation of humanitarian law by Nicaraguan contras in the 1980s by producing a manual titled Operaciones sicológicas en guerra de guerrillas, but this encouragement was not sufficient to make the contras’ violations attributable to the United States. Here’s a sentence: the Estonian government’s 2007 decision to move a statue from the center of its capital city to its outskirts set in motion a chain of events which brought much clarity to the international law on cyber operations. The removal of the Bronze Soldier from the center of Tallinn—a statute seen by many ethnic Russians as a tribute to Estonian liberation from Nazism but seen by many Estonians as a monument to Soviet oppression—ignited nationalistic protests amongst Estonia’s ethnic Russian population, egged on by Russian-language media. Riots and looting were followed by a cavalcade of cyber attacks by Russian operators on Estonian news outlets, banks, and government ministries. Estonia was completely unprepared for the resulting disruption, and the incident served as a wake-up call, sparking the country’s transformation into “E-stonia,” with a massive increase in awareness of cyber security and related issues amongst its population, an overhaul of government cyber infrastructure, and the creation of its thousands-strong voluntary Cyber Defense Unit. It also prompted Estonia to host the creation of the historic Tallinn Manual. The Tallinn Manual aims to be an objective statement of the current law on cyber operations, a non-binding document intended to provide clarity in the law akin to the San Remo Manual for naval warfare. Prepared by a group of experts under the auspices of the NATO Cooperative Cyber Defence Centre of Excellence, the first version of 2013 addresses international humanitarian law and the law on the use of force, while Tallinn Manual 2.0 of 2017 extends its scope to other branches of international law, such as sovereignty, human rights law, the law of the sea, and telecommunication law. To give one example, the Manual defines an “attack” for cyber purposes as “a cyber operation, whether offensive or defensive, that is reasonably expected to cause injury or death to persons or damage or destruction to objects”—the so-called “functional approach” that does not require kinetic force and focuses on the consequential effect on the target. The Manual is widely considered a high-quality statement of the existing law and serves as a valuable reference tool in this ever-evolving area of law. Expanding and flattening bullets are prohibited as causing superfluous injury and unnecessary suffering. The prohibition covers a variety of ammunition, primarily those with a hard envelope which does not cover the core entirely or are pierced with incisions (dum-dum bullets), which create wounds larger than their diameter. Their use is a war crime in the International Criminal Court. The snappily-named 1980 Convention on Prohibitions or Restrictions on the Use of Certain Conventional Weapons Which May Be Deemed to be Excessively Injurious or to Have Indiscriminate Effects, does exactly what its name suggests. The Convention and its Protocols, which apply in time of armed conflict, addresses a wide range of weapons including the following sample. Non-detectable fragments—those which in the human body escape detection by x-rays—cause unnecessary suffering and are prohibited. Munitions which cause glass or plastic fragments cause agony in their victims and unnecessarily inhibit the treatment of wounds, and are therefore banned under Protocol I of the CCW. Booby-traps can be of a kind to operate indiscriminately, and so their use is regulated, though not comprehensively prohibited. These victim-activated weapons may only be laid when adequate precautions are taken to protect civilians. Under CCW Protocol II, explosive booby-traps are banned, while other traps may not be made to resemble specified articles such as specially protected objects, graves, children’s toys, food and drink, religious objects, or historic monuments. Incendiary weapons can operate indiscriminately and cause unnecessary suffering. They are not totally banned, but their use is restricted. Under CCW Protocol III, incendiary weapons (those which set fire to objects or cause burn injuries, such as flamethrowers) may not be used against military objectives within civilian areas, or against the natural environment. Blinding laser weapons can cause unnecessary suffering and are prohibited. Under Protocol IV, the prohibition extends to laser weapons specifically designed to cause permanent blindness to unenhanced vision. The methods of warfare broadly refers to the manner in which an armed force employs its resources—weapons, tactics, strategy, information, movement—to overcome the enemy. Many methods of warfare are recognized as unlawful as contrary to the fundamental principles of the laws of war. Let’s take a tour. It is prohibited to threaten or order that there shall be no survivors or to conduct hostilities on that basis. While it is permissible to intentionally kill an enemy combatant in the conduct of hostilities, adversaries who are captured or who surrender may not be killed and must be kept as prisoners of war or internees. Declaring that no quarter will be given is a war crime and, as the United States’ defense manual recognizes, contrary to both humanitarian and military considerations: as well as resulting in unnecessary deaths on all sides, it stiffens an adversary’s will to resist and is therefore counterproductive to the achievement of the legitimate objectives of military operations. Inviting the enemy to think that a person is entitled to protection under international humanitarian law with the intent on betraying that confidence is prohibited. Attacks carried out under this guise are known as perfidy. On the other hand, ruses of war—such as camouflage, decoys, mock operations, and misinformation—are not prohibited and indeed form the foundation of military operations. What’s the difference? Ruses are simply attempts to gain an advantage by misleading the adversary or inducing them to act recklessly, while perfidy undermines the protections to the civilian population and protected objects. Take the simplest example of perfidy: attacking an enemy combatant after feigning a surrender. If a fighter abuses their right to surrender by turning on a would-be captor while their guard is down, future surrenders are unlikely to be trusted, inviting a cascading sequence of summary executions. Acts of perfidy causing death or serious injury are war crimes—other examples include attacking while feigning the following protected statuses: intent to negotiate under a flag of truce, incapacitation by wounds or sickness, civilian non-combatant status; or by using the uniform or emblems of the United Nations, the enemy or neutral parties, or medical and religious personnel. Here’s a very specific prohibition: it’s prohibited to attack a person parachuting from an aircraft in distress during their descent, unless it is clear that they are engaging in hostile acts on their way down. Such a parachutist must be given the opportunity to surrender upon reaching the ground, a manifestation of the general rule against attacking an adversary who is defenseless. Acts of terrorism are prohibited in war. There are various definitions of terrorist acts in different areas of international and domestic law, and IHL outlaws “acts or threats of violence the primary purpose of which is to spread terror among the civilian population.” Similarly, hostage-taking is specifically prohibited, and would anyway breach the obligations to not attack civilians or to treat enemy combatants humanely after capture. It is prohibited to employ methods or means of warfare which are intended or may be expected to cause widespread, long-term and severe damage to the natural environment. Starvation of civilians as a method of warfare is prohibited. On the other hand, it is not prohibited to starve enemy combatants (for example by surrounding the adversary in a closed location and cutting off provisions to induce them to surrender) or to attack objects used as sustenance solely for members of the armed forces or in direct support of military action. Attacks against objects indispensable to the survival of the civilian population—such as foodstuffs, agricultural areas, crops, livestock, drinking water installations, and supplies and irrigation works—are prohibited, except when in defense of its national territory against invasion a party to a conflict must resort to scorched earth tactics on territory under its control for reasons of imperative military necessity. Blockades are a well-known method to deprive the adversary of supplies needed to conduct hostilities, but the general obligation to protect the civilian population and the obligation to permit humanitarian assistance mean that blockades may not be absolute. The use of human shields to deter attacks on objectives which may otherwise lawfully be targeted is prohibited. It’s likewise unlawful to use the presence or movement of civilians or the civilian population, prisoners of war, or medical units to render certain points or areas immune from military operations. The unlawful use of human shields—for example making civilians physically present at a legitimately targetable personnel base—does not by itself turn a legitimate target into an illegitimate one, but will impact on the proportionality assessment of whether an attack on the target is lawful in the circumstances. There are differing opinions as to the consequences of persons acting as voluntary human shields—yes, voluntary human shields—and whether their actions constitute direct participation in hostilities, making them a legitimate target. In peacetime, in response to wrongful acts by one nation, it is lawful and very common for a wronged nation to undertake countermeasures—the non-performance for the time being of their obligations toward that nation—in order to induce the first nation to comply with its obligations. (The primary tool of the World Trade Organization’s dispute settlement mechanism, for example, is the authorization of countermeasures.) By contrast, the obligation to respect and ensure respect for international humanitarian law does not depend on reciprocity—in other words, breaches by one party to a conflict do not release another party from its obligation to comply with the law. In modern warfare, belligerent reprisals—counter-violations of IHL made with the purpose of inducing the enemy to terminate a violation of its own—are almost entirely outlawed. Reprisals are only allowed under very strict conditions, and there is a trend towards outlawing them entirely in international humanitarian law. Reprisals against protected persons under any of the four Geneva Conventions—the wounded and sick, the shipwrecked at sea, prisoners of war, and protected civilians—are strictly prohibited. Reprisals against cultural objects and places of worship, objects indispensable to the survival of the civilian population, the natural environment, and works and installations containing dangerous forces are all prohibited. Parties to a non-international armed conflict do not have the right to resort to belligerent reprisals in any circumstances. The next and final installment of this series will cover international criminal law.